A NASA spacecraft that discovered and characterized tens of thousands of asteroids throughout the solar system before being placed in hibernation will return to service for three more years starting in September, assisting the agency in its effort to identify the population of potentially hazardous near-Earth objects, as well as those suitable for asteroid exploration missions. The Wide-field Infrared Survey Explorer (WISE) will be revived next month with the goal of discovering and characterizing near-Earth objects (NEOs), space rocks that can be found orbiting within 28 million miles (45 million kilometers) from Earth’s path around the sun. NASA anticipates WISE will use its 16-inch (40-centimeter) telescope and infrared cameras to discover about 150 previously unknown NEOs and characterize the size, albedo and thermal properties of about 2,000 others — including some which could be candidates for the agency’s recently announced asteroid initiative. “The WISE mission achieved its mission’s goals and as NEOWISE extended the science even further in its survey of asteroids. NASA is now extending that record of success, which will enhance our ability to find potentially hazardous asteroids, and support the new asteroid initiative,” said John Grunsfeld, NASA’s associate administrator for science in Washington. NASA’s asteroid initiative will be the first mission to identify, capture and relocate an asteroid. It represents an unprecedented technological feat that will lead to new scientific discoveries and technological capabilities that will help protect our home planet. The asteroid initiative brings together the best of NASA’s science, technology and human exploration efforts to achieve President Obama’s goal of sending humans to an asteroid by 2025. Launched in December 2009 to look for the glow of celestial heat sources from asteroids, stars and galaxies, WISE made about 7,500 images every day during its primary mission, from January 2010 to February 2011. As part of a project called NEOWISE, the spacecraft made the most accurate survey to date of NEOs. NASA turned most of WISE’s electronics off when it completed its primary mission. Because asteroids reflect but do not emit visible light, infrared sensors are a powerful tool for discovering, cataloging and understanding the asteroid population. Depending on an object’s reflectivity, or albedo, a small, light-colored space rock can look the same as a big, dark one. As a result, data collected with optical telescopes using visible light can be deceiving. During 2010, NEOWISE observed about 158,000 rocky bodies out of approximately 600,000 known objects. Discoveries included 21 comets, more than 34,000 asteroids in the main belt between Mars and Jupiter, and 135 near-Earth objects. The WISE prime mission was to scan the entire celestial sky in infrared light. It captured more than 2.7 million images in multiple infrared wavelengths and cataloged more than 560 million objects in space, ranging from galaxies faraway to asteroids and comets much closer to Earth. JPL manages WISE for NASA’s Science Mission Directorate at the agency’s headquarters in Washington. The mission is part of NASA’s Explorers Program, which NASA’s Goddard Space Flight Center in Greenbelt, Md., manages. The Space Dynamics Laboratory in Logan, Utah, built the science instrument. Ball Aerospace & Technologies Corp. of Boulder, Colo., built the spacecraft. Science operations and data processing take place at the Infrared Processing and Analysis Center at the California Institute of Technology in Pasadena. Caltech manages JPL for NASA. 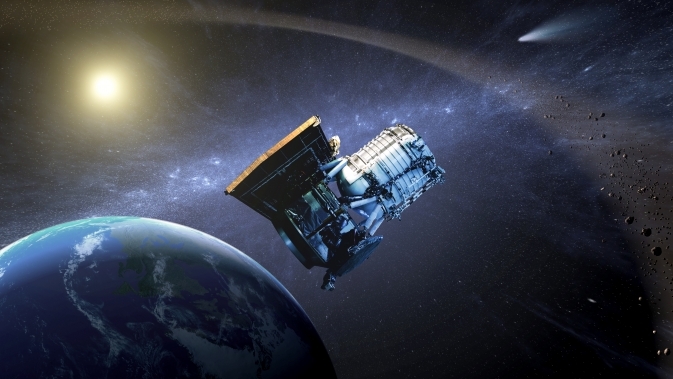 More information about NEOWISE is available online at: http://www.nasa.gov/wise and http://www.jpl.nasa.gov/wise/ . For more information on the asteroid initiative, visit: http://www.nasa.gov/asteroidinitiative .